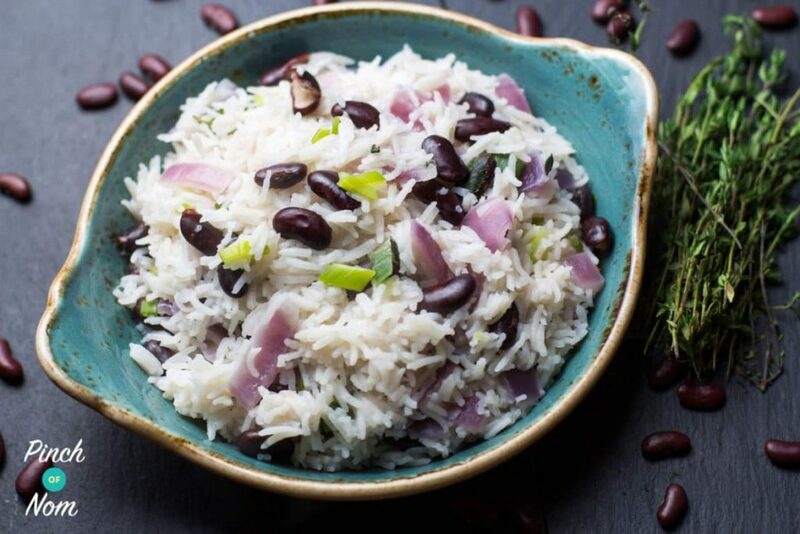 The traditional Rice and Peas recipe contains quite a lot of coconut milk, which is pretty high in syns, so we’ve made this 1 Syn Rice and Peas version a bit more Slimming World friendly. Regular coconut milk is at least 30 syns for a 400ml can, which would be at least 7 or 8 syns a portion. Even the low fat or light versions are around 15 syns for a 400ml can. A perfect substitute for the coconut milk is Alpro Coconut Drink, which is 1 syn for 100ml. It gives that slightly sweet coconutty flavour without the added syn value. This 1 Syn Rice and Peas dish is a great side dish to many Jamaican meals. In fact it’s perfect with our Syn Free Jamaican Oxtail Stew. If you’re wondering about the ‘Peas’ in this recipe, they’re not what we would call peas. They’re actually dried beans, such as Kidney Beans or Black Eyed Beans. In the Caribbean these beans are referred to as “peas”. Hence the name. 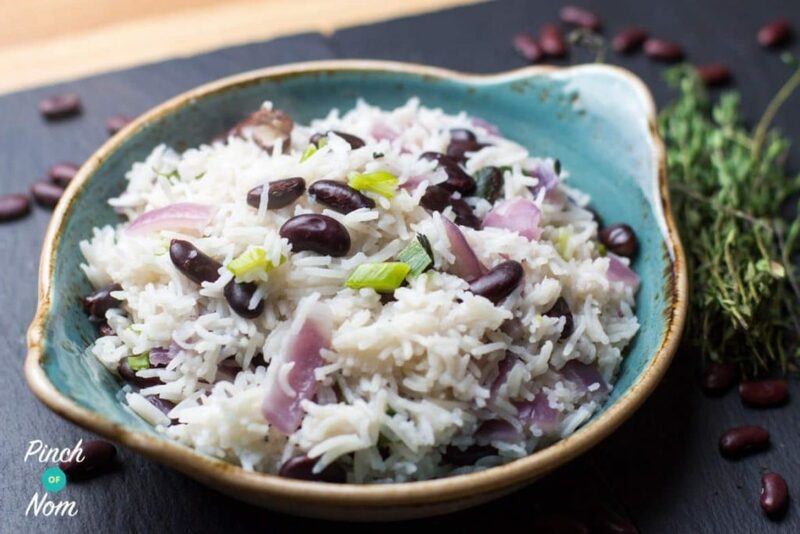 Some of you love this 1 Syn Rice and Peas recipe! 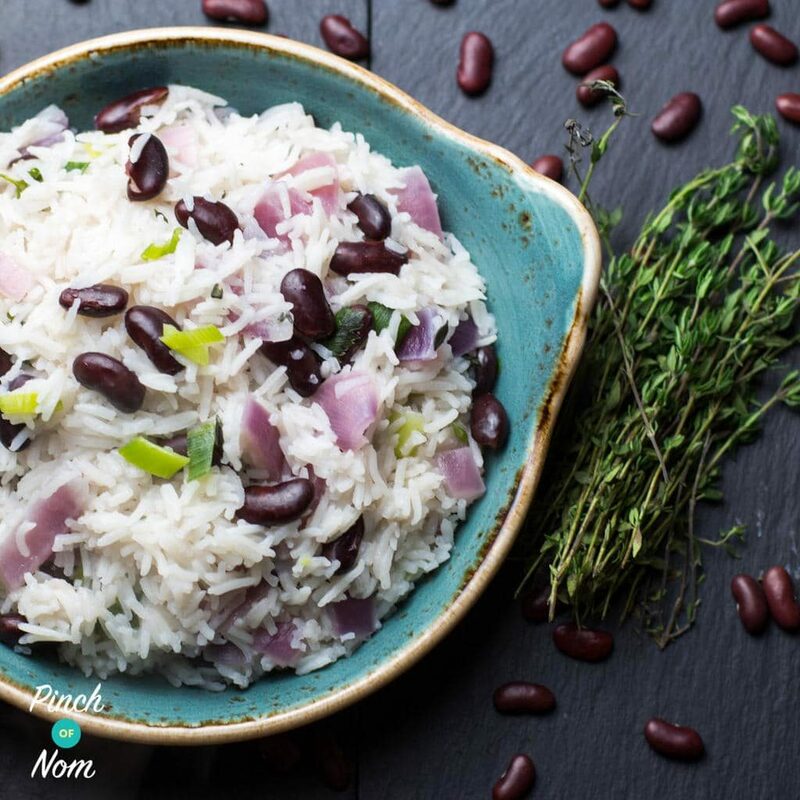 If you make this 1 Syn Rice and Peas recipe, snap a pic and hashtag it #pinchofnom — We love to see your creations on Instagram, Facebook, & Twitter! This was delicious but I found that the coconut drink was not enough liquid to cook the amount of rice in despite adding lots of water, it ended up burning the pan and just all sticking together, the small unburned bit I did try was lovely but unfortunately had to throw it all away. 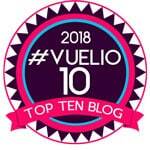 I followed you recipe 100% so any ideas where I could have gone wrong please. Can you advise what the syn is for please? 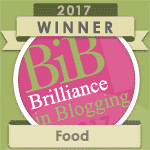 Obviously all our recipes can be interpreted and altered to suit your tastes! I don’t really like coconut very much so is there a substitute that I can use other than just water? Also could I freeze this as I am cooking for one? Hiya. Just made this an it was delicious. Got leftovers – do you think it’d be OK to freeze for another time?